Toothache is a common health problem. Its causes, symptoms, treatment and preventive methods are all interlinked. Know how to deal with it efficiently. Do you fear of visiting the dentist to get that terrible toothache treated? Wondering if the problem could get worse? People commonly associate dental treatments with painful procedures such as root canals, injections and even tooth extractions, which make them be reluctant to visit a dentist until they have reached the end of the rope. Thanks to rapid advances in technology and medical sciences, there are now more treatment options available than ever before to do away with the ache in a much more effective and convenient manner. This is the most common culprit behind a toothache. Tooth decay arises when food and bacteria collect in small crevices in the surface of the tooth, resulting in the formation of plaque which eventually turns into tartar. The acid from the decomposition of the food particles and certain bacteria erodes the enamel (natural covering of the tooth), making the sensitive inner tooth exposed and get irritated. Wisdom teeth are the last of the molars, which begin to appear around the late teenage years. During this time, the gums around these teeth become swollen and often more susceptible to bacterial infections which can cause great pain. Bacterial infections of the sinus (cavities behind the eyes and nose that produce mucus) can lead to a blockage of these nasal passages resulting in jaw pain and stiffness that can lead to toothache. Pain due to heart and lung problems may at times be relayed to the maxillofacial area through a complex network of nerve endings, which will cause toothache. Factors such as certain neurological disorders, nerve damage and change in nerve conduction patterns may also cause toothache without any actual problem with the tooth itself. 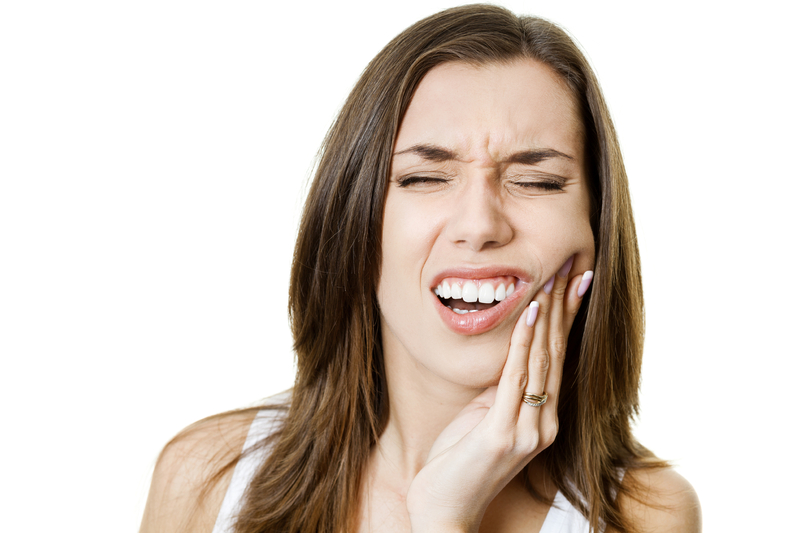 Feeling pain while eating or masticating as this exerts strain upon the damaged tooth. Feeling a sharp discomforting pain especially when consuming hot or cold substances. This is also known as tooth sensitivity, which occurs when a nerve has been irritated. Presence of blood or other fluids around the teeth and gums. Swollen or inflamed gums especially surrounding the teeth. In some cases, the swelling and inflammation may also spread to the jaw line, which is usually uncomfortable and often visible. Any pain is experienced by gentle application of a small amount of pressure to a seemingly normal looking tooth. It is imperative that people should visit a doctor immediately for further examination if any of the following signs or symptoms exist. If you feel infection or pain may be spreading to other areas and in case of a further increase in swelling or redness. If you find it difficult to breathe or are feeling faint due to a shortage of oxygen. If you experience any pain in the thoracic or cardiac region. If there is any persistent coughing or blood loss through coughing. Avoid hot or cold foods. A little bit of caution can go a long way. People suffering from toothaches are advised not to consume food items that are either too hot or too cold as that can considerably exacerbate the ache. OTC pain medications. Buy some OTC pain medications, such as ibuprofen and paracetamol. These can be orally administered and must be taken at equal intervals to help alleviate the pain. Clove oil. It is another easily accessible item that can be used as an effective solution. Place a clean cotton ball saturated with clove oil on the aching tooth and holding firmly between teeth to help ease the pain. Garlic and onions. They are common household items that are effective antiseptics against bacteria, which cause infections. Chewing them in their raw form releases these medicinal agents, and can offer quick relief against toothache. Warm salty water. Gargle with warm salt water which acts fast as it helps to soothe the gums while killing harmful bacteria. Wheatgrass water. Gargling with wheatgrass fluid also helps. Simply crush the wheatgrass in a blender and then drain the liquid. The same technique may be applied to spinach leaves too. Ice cubes. Ice cubes wrapped in fabric or foil can be used as an ice pack to cover the painful area or the ice may also be directly applied. This helps by acting like a local anesthetic that momentarily numbs the pain. Salt and pepper. Mixing together salt and crushed black pepper and applying it to the aching tooth is great for reducing pain significantly. When suffering from a toothache the most obvious solution is to visit one’s dentist. The dentist will start by asking the patient about his or her signs and symptoms and then perform a thorough physical examination to search for underlying problems. If that does not yield enough results to reach a diagnosis, he may send the patient in for x-rays. If the problem is recognized, the dentist may prescribe medicines or suggest a surgical treatment. He may also suggest the patient to a doctor for further investigation if little information is available to reach a diagnosis. Brush and floss often. It is essential to brush your teeth daily at least twice a day, especially before going to bed. Along with a strict brushing regime, flossing after meals is also highly recommended to maintain cleanliness. Take in fluoridated things. The use of toothpastes and water containing fluoride is highly advisable as it helps protect the enamel. Alternatively, fluoride supplements may also be taking orally. Visit dentist regularly. Semiannual teeth cleanings and checkups with your dentist are a must. This ensures that any problems that may be developing can be caught and rectified early. Don’t smoke. Cigarette contains various harmful chemicals that are detrimental to the gums and teeth. Lessen the intake of sugary food and drink. Sugary Food and Drink create an ideal condition for harmful bacteria to flourish in. Avoiding these products can slow down the process of tooth decay significantly and effectively. Use mouth guards during sports. You’d better wear some protective mouthpieces while playing sports in order to prevent damage to the teeth.